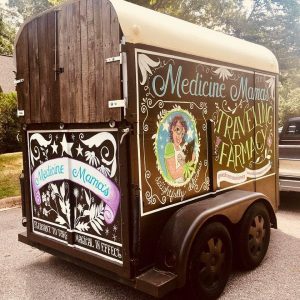 Medicine Mama’s Farmacy – Coming to a Curb Near You! We are Raleigh’s first CBD & Hemp mobile vending “food” truck to offer homemade natural CBD infused edibles and other items using 100% locally farmed and manufactured NC Hemp. Medicine Mama’s Farmacy goal is to be a voice in the CBD movement and getting the public informed to help extinguish the stigma that is associated with CBD/Hemp. As well as to make the tastiest CBD edibles y’all ever had! By sourcing hemp from NC farmers only, Medicine Mama’s Farmacy hopes to push for sustainable farming and manufacturing of this magical plant. We’re happy to be able to help others, after all that’s what it is all about.